I'm seeing the same thing for one of my client's sites. The homepage was ranking #3 along with a subpage on page 2 result #1. After the update, the subpage is now in the #3 position and our homepage was pushed to page 5. The bounce rate is higher than ever and conversions are down too. The exact same thing happened for another competitive phrase. I guess the only solution is to do some CRO on the subpages. Could it be A-B testing ? Could it be that Google is just providing different results to see which one has the best CTR ? Exactly right. They are likely trying to optimize search relevancy and user experience. While a site's homepage might have the most amount of raw authority, there might be more pages on the site that have a higher relevancy score. I posted this question in Warrior (and got a link to this post). Yes, noticed this happening about 4-5 days ago. Another important point is that this will make a well designed site more important than ever. In other words visitors need to know, without fumbling around, how to navigate to anywhere from the sub pages. btw, does this update have a name yet? I was just wondering if a search engine made some changes it will reflect those of all the pages of a site. I've noticed that most of the time the landing page usually the home page has a high pr compare to others. I have learn many seo tips from your site. Thanks very much. I can only see this as a good thing, I noticed several of my pages ranking higher than my homepage all of a sudden, and I like that. My homepage is not my main landing page, each of may pages draws on something different and I would like to get those pages higher in the SERP and not my homepage. But, like noted above, we will have to see what causes that ranking. Indeed, that's what is happening. Out of blue, a few keyword searches started to display my website internal pages. It stays like that for a few days and then switches to the home page. Then another few days and it switches to the internal page and so on... Is it an indication of something? "It is hard to explain in a straightforward manner that page A might be ranking due to relevancy signals pointing into page B, but these are the SERPs through which we make a living. And it is only going to keep growing more complex. ;)"
I agree that its getting more complex, but is it really gonna be that complex? I mean..before the technical algo stuff was relatively simple to understand for anyone with a real interest in SEO as a career (Id say), whereas the difficulty lied in being a good marketer..and with this stuff it seems that the complexity of SEO is sort of approaching the technical complexity of other technical/IT/etc. fields. So in other words id agree its getting more complex, but really not too complex that it should be a serious barrier to entry for anyone who actually wants to choose this SEO/IM thing as a career, right? my point is (wow im taking long to make it :D), the increasing complexity should really just be a problem for people making a half-hearted effort....but not something that should put off newbies who are serious about it. Am I underestimating how difficult this stuff is to grasp for people new to the field? Yes you are under-estimating it, and significantly so. The thing you are missing (in comparing it to any other IT field) is that there is no self-check routine, there is only the end result. And everything you measure that is between where you are and the end result is only a partial picture. There is nothing telling you that it is because of what is going on with page x that is causing page y to do something. There is nothing telling you that company z running a large branding ad campaign that caused more brand searches for them which helped cause them to rank better for your keyword. This data you can only make inferences to. Most other IT fields you get to see the how and the why and the what fairly transparently throughout ... whereas here you only get the end result & have to guess backwards at the code. It is completely non-trivial, particularly when you bake in algorithmic factors you can't measure and things like search result localization. The sea is further clouded by Google's effort to monetize more of the search results. Entire categories can get torched overnight ... businesses that went into a day with a 20% profit margin could end up building a business which sees that 20% profit margin shift to -20% overnight. Google Instant increased AdWords clicks 5% overnight. Look what happened to the local search results recently. At some point the complexity rises to the level that it is only viable and valuable to those who already have many of the other signals in place. Lone wolf SEO will get harder and harder. And that is before you take into account the waves of newly unemployed joining the ranks of competitors online, leaving the remaining pie to be split by even more people. very interesting - thanks for clarifying! when you say "many of the other signals in place" and "lone wolf SEO will get harder"...does this mean you're referring mostly to people trying to start their own profitable sites....or do you mean the seo job market (in-house, consulting,...) just as much? this makes me wonder about the bigger picture of traffic acquisition...Ive often wondered if people underestimate the lifetime value attached to traffic that flows directly through links. they always say "I only get 10% of my new traffic from links, and 90 from google"(a bit simplified), but completely forget the LTV of link traffic and the passiveness of it once the links are in place....Could the battle for traffic somewhat shift to other sources of traffic acquisition, because of this? I mean this...if you go to the SEO conferences that cost thousands of Dollars to attend, over the past 3 years the % of people who were in-house SEOs went likely from about 1/3 that audience to about 2/3 the audience. Doing what people like I do is becoming more capital intensive. As people like me reinvest profits into furthering our growth, and Google adds in a wider variety of signals to search, and as Google obfuscates the algorithms better ... it is becoming far more challenging to rank for some of the most competitive phrases unless you have some key points of leverage in place ( brand / social connections / domain names / capital to invest into buying marketshare & exposure / site age / link authority). You do not need all those to win a market, but increasingly you are needing more of them to stay competitive in the most competitive markets. This shouldn't be a surprising trend though, as it is what happens when markets mature. The key is figuring out where you will be able to have a sustainable competitive advantage and sustainable margins. A lot of businesses are slowly dying because they are not willing to make big changes. Remember how we moved away from selling an ebook to offering the membership site? That was a huge high-risk change that most businesses would not have took. Most would have stuck with the old model until it was in steady decline rather than pivoting while still on the upswing. thanks for the explanation, once again, Aaron! I think I do understand what you're saying...and you were apparently referring mostly to people running their own sites/businesses having an increasingly harder time to compete in Google, because of the complexity (as I had guessed, and as this recent reply seems to confirm). Of course in-house SEO isnt gonna become any easier (as a career path), because of those changes but if I get your point then the main issue is new businesses/websites having a harder time to get into google's top10. (if Im way off, feel free to tell me :D, but if im not way of no need to reply...dont wanna take up too much of your time with this stuff!). Btw,..was gonna mention this the other day - I dont know your membership site content, but one thing that I feel your e-book lacked (dont get me wrong, I liked the book a ton, this is just feedback) was a big picture explanation of the way google works. It tooks me four years to fully grasp (you know theres a difference between understanding something a little, and fully grasping it) that google is actually nothing but a website..that receives type in traffic and monetizes it through their (highly relevant) ads...and that they have the main goal of making money on their mind as most commercial websites on the internet ;-). once i realized that the whole stuff youre saying about google making changes to xyz possibly in order to increase quarterly earnings (admittedly i still need to figure out how shareholders fit into the picture)...all of a sudden started to make way more sense. If I ever have to explain to someone what this SEO stuff is all about, Id use that google=just another website/business on the internet..and youre trying to create a win/win situation to get a link on their website..to get the point across. I feel that would have made the whole seo algorithm thing (especially, now?) much easier to understand in the beginning (or even during the first 3+ years - it only clicked in my head recently). then again everyone learns differently so maybe the big picture thing wont get the point across to everyone, just thought id bring this up b/c i thikn its one of the things that would have made your e-book a(n even) better resource back then (and maybe your membership site, now if the complexity of this stuff is gonna increase more and more). no need to reply to this comment,just an attempt to give something back :D.. In-house SEO will also become somewhat less appealing due to wage compression and a glut of supply of potential employees. The one thing that saves in-house IMHO is just how complex things are getting. It means that when you consider how bureaucratic most large companies are, they will likely screw something up if they don't have someone "in charge" of the SEO. I see your point about it becoming more complex, and the ticket to entry rising. But at the same time, I see this as a potential opportunity for SEO experts, because it raises the demand for their work. When I started to get into SEO, it was not my planned path. I was running an ecommerce store and simply wanted to rank on the front page of Google so I could sell more. So I did a little research (on your site, among others) and within a few months I was in position 9 for a moderatley competitive keyword. That was based on a ver limited understanding of what I was doing. As things get more complicated, there's no way I could have the same success, I did many things wrong. I would have had to pay a third party for this, and I would have because I wanted my business to succeed. Another area is local SEO. Joe the plumber is on page 5 because he has a crappy website, that doesn't even mention plumbing in his title. On page 1 are the big national chains. The thing is, it would be easy for Jow to rank in the top 5 with some simple changes, since he is only trying to market one small area. As things get more complex, he won't be able to do that himself, which opens the opportunity for experts like us. But (outside of perhaps that chance in local) generally as the SEO field gets more complex, cost will ramp faster than perceived value. Add in the market for lemons effect and it wouldn't matter that people would want to pay 3rd parties for the service...ultimately the issue that harms most people is that they are attracted to the lure of "free" traffic ... so they buy a cheap service, get scammed & then become more guarded before buying again...guaranteeing they will buy another bunk service. Let us not forget...a search engine results page (SERP), is the entire list of web pages returned in response to a keyword query. The results are presented with a title, a link to the page, and a short description about the page. But the average search shopper sees it as a description about the "Site". If your in it for the money (Sales)....then it's a good thing that Google finds an interior page that is more relevant to the search in regards to a more marketing relevant SERP as apposed to the page we think is better for selling. If Google is caching SERPs for frequent searches and displaying the cached SERP instead of a live SERP to increase the performance of the search....then their doing us a favor (IF!) they are in fact able to crawl and actually find a better page for "selling". But how do they do that? And! if they do return a page that is more marketable than the page that is ranking, Great! So...this shouldn't be a concern that Google is controlling us but rather a concern that we are not manufacturing our sites for selling as well as we should be. There are two sides to the story here. I think we can all agree that Google has some experience with relevancy. We too have experience with relevancy. Assuming that all we want for our customers and for our selves is visitors converting to sales .....can conversions be based on relevancy alone? No! sales landing pages need to be both relevant and well presented calls to action. Because a call to action (a call to buy) will not happen if the sales landing page is not relevant to that which the shopper thought he or she was going to enter. So both are very important. Wikipedia helps us appreciate that Google is looking for different types of listings: contextual, algorithmic or organic search listings, as well as sponsored listings, images, maps, definitions, videos or suggested search refinements. They visually differentiate specific content types, such as images, news, and blogs. 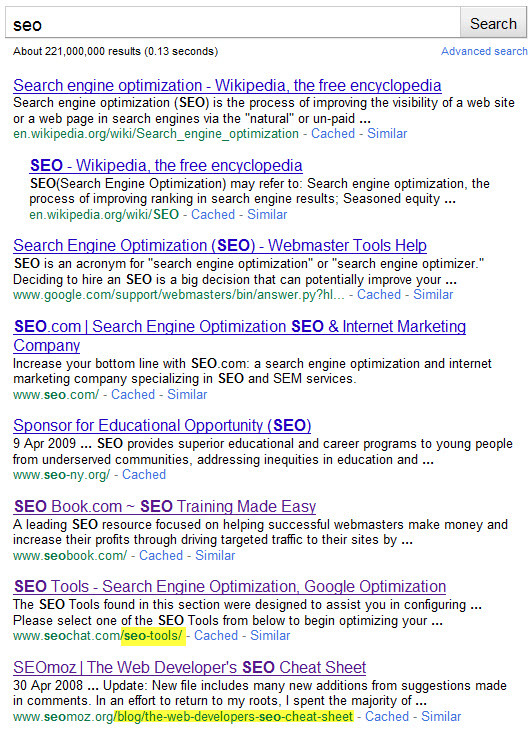 Many content types have specialized SERP templates and visual enhancements on the main search result page. And let us not forget that Google uses content contained within the Metadata tags of a web page to generate the content that makes up a search snippet. The title tag will be used as the title of the snippet while the most relevant or useful contents of the web page (description tag or page copy) will be used for the description. If the web page is not available, They have to find one. And we all know....There are many criteria to numerous to be in control of. Again, If Google returns an interior page rather than the one we are ranking well with, ...is that a problem? It doesn't damage our ranking for the moment but it doe's show us that we need to consider what Google is calling relevant. They are showing us the many criteria to numerous to be in control of. Perhaps being shown the many criteria to numerous to be in control of might not be so bad. In my seo business I use the Shenanigans of Google from time - to - time as a tool and consider them as kind of a freebie and a wink from Google as if they are saying: This is what we want this time around. And I make adjustments accordingly. And it works. If you want to rank well in the search results with limited risk then typically (especially for smaller businesses in somewhat competitive markets) you have to build some informational pages to help pull in links. Google can largely tell if a page tends to have a commercial bias or a sales oriented bias. If Google tends to slant their results toward informational pages (changing the page that ranks as they wish, picking the snippet they want as they wish, and replacing your page title with something else as they wish) then you are no longer in control of your marketing messages. Sure you can try to make every page more conversion focused, but what if that ends up causing people to be less likely to link into your website? The strategy gets much more complex & nuanced. Finally, and the main point of the above post, was that it is harder to analyze why a page ranks if that page is ranking based on the criteria from some other page. That in and of itself makes SEO analysis *much* harder. I am not saying that Google listing internal pages is always a bad thing, or even that it is generally a bad thing. It just makes SEO harder & puts more control in their hands and less in yours. I am not really worried about my ability to keep up with the changes Google makes & leverage new signals for profit, but I do think at some point SEO will be much harder to teach as it grows more abstract. Google is making these changes? Are they doing it to make it easier for customers to find companies or harder for companies to get ranked? I'm new to this so trying to understand SEO. Thanks for the info when I signed up. @Aaron: thanks (again) for breaking that stuff down to me.